Detail of Reflections (Oil Bar Painting as of August 21, 2013), a photo by randubnick on Flickr. Yesterday I posted my oil bar painting as it looked on August 21, 2013. I have been painting a scene from Bradley Palmer State Park, from a photo that I took there one summer day. (The photo is available here on June 14.) Tonight I am posting a closeup view of the painting as it looked on the 21st. 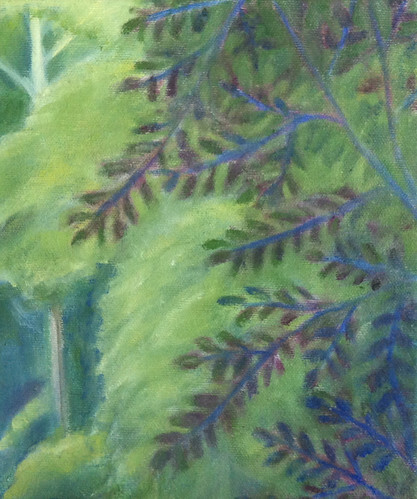 I created suggestions of branches peeking through the foliage in some of the trees, and reworked the shapes of the branches in the tree-tops (at the very top edge of the canvas). Reflections (Oil Bar Painting as of August 21, 2013), a photo by randubnick on Flickr. Here is my oil bar painting in progress as it looked on August 21 (last Wednesday). Despite the gaps in my posts, I worked every morning on this landscape. This painting based on a photo that I took at Bradley Palmer State Park. (The reference photo is posted here on June 14, 2013.) So last Wednesday, although I thought the painting was almost finished, I decided to rework the tree-tops (the top few inches of the canvas), making the branches more graceful. I also added suggestions of branches to some of the foliage shapes, to make it clearer how the foliage is connected to the tree trunks. This is a lot of detail, but it makes a difference. I plan to post the closeup view tomorrow. 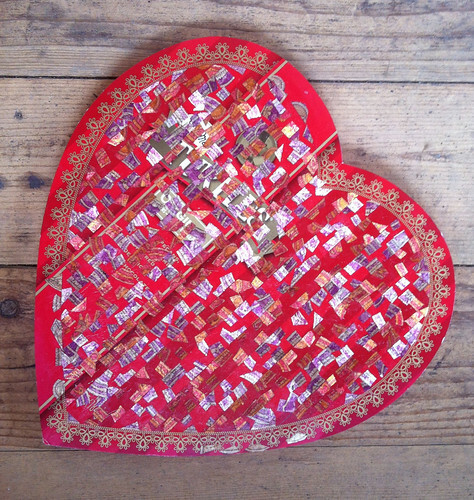 Another Heart Shaped Box as of August 27, 2013, a photo by randubnick on Flickr. 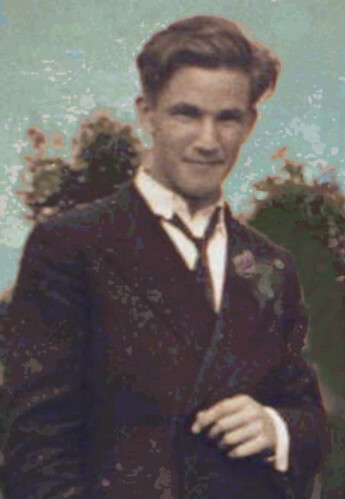 Dad with Boutonniere (Digitally Modified Photo), a photo by randubnick on Flickr. This image began with a photo of my father that I came across yesterday. (Well, in fact, it was a digital image, from a CD of family photos given to me by my aunt.) I really like this picture of my father as a young man. The image I started with was a group shot of my father with several other guys.The version I had was very small and marred with scratches. But I really liked the picture of my dad and decided to see if I could do something with the image. So I started in iPhoto, cleaning up scratches with the retouch tool. Then I opened the image in Painter, resized the image, and then used cut-and-paste to cover up the other people in the shot. (Sorry, guys.) Then I used digital pastel, color overlays, and posterizing to get the colors and textures in the image. I am posting this today because my father's birthday was August 28. Detail of Reflections (Oil Bar Painting as of August 20), a photo by randubnick on Flickr. Reflections (Oil Bar Painting as of August 20, 2013), a photo by randubnick on Flickr. Here is my oil bar painting in progress as it looked last Tuesday, August 20. I have been painting a scene from Bradley Palmer State Park (Topsfield, MA), based on a photo that I took there. (The reference photo is posted here on June 14.) I would have said that this painting was finished on the 18th or 19th of August. But there were some changes I wanted to make and I decided to take a risk and make them. I have been spending a lot of time looking at trees (eating outside on the deck, etc.) and one evening realized how much brown I was seeing in the trees. Now when this painting was in its early stages, I decided that the dark blue for shadows was too strong and decided to try brown instead. But I didn't like it, missed the blue, and reversed it. This time I decided to just add touches of brown to the darkest shadows and very light brown to the tree trunks, but leaving most of the dark blue alone. But before I touched the canvas, I tried it out digitally, adding brown to a jpg of the painting, and then comparing the two versions. I decided to make the change, so on the 20th I mixed up a brown that had a lot of purple tones and added it to some of the shadows. Then I mixed it with white and got a light brown that is close to mauve, and added it to the tree trunks. It's a pretty subtle difference, but I think adding the brown makes the eye and brain see the color as a bit more realistic. But there was still enough blue to make me happy. As I worked, I made a few small changes in the trees and branches. Almost finished, but there were a few more changes to come. . . .
Reflections (Oil Bar Painting as of August 19, 2013), a photo by randubnick on Flickr. I have been working on this painting every morning and posting my progress. This is how it looked back on August 19th (last Monday). I am using oil bars to paint this scene at Bradley Palmer State Park, in Topsfield, MA, working from a photo that I took there. (The reference photo is posted here on June 14.) When I worked on this last Monday, I thought it was almost finished, so I was making small changes. Specifically, I was trying to add some definition and contrast with some deep shadows in dark blue. Of course any change I made "on land" had to be made in the reflected image as well, so I spent a lot of time turning the canvas sideways and upside-down. I thought the additional contrast helped, and was pretty happy with the painting, but nonetheless there were changes to come. To be continued. . . .
Reflections (Oil Bar Painting as of August 18, 2013), a photo by randubnick on Flickr. Here is my oil bar painting in progress as it looked on August 18, 2013. This landscape is based on a photo that I took at Bradley Palmer State Park in Topsfield, MA (posted here June 14.) I have been working on this painting every morning and progress seems slow, somedays slower than others. Back on August 18th, thinking that I was very close to finished, I was concentrating on adding touches of light and dark to create shape and texture in the foliage. I was happy with what I did. But of course, I wasn't finished, and these weren't finishing touches. 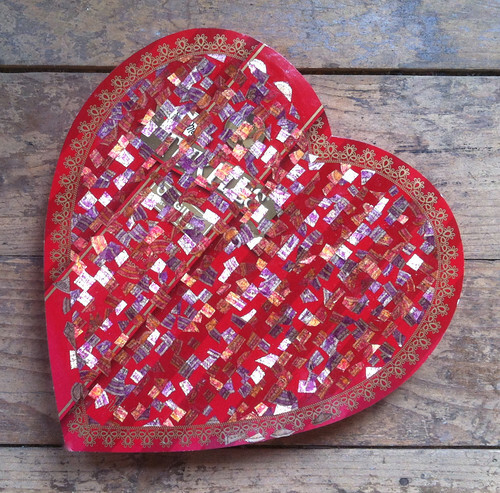 Another Heart Shaped Box as of August 22, 2013, a photo by randubnick on Flickr. Reflections (Oil Bar Painting as of August 17, 2013), a photo by randubnick on Flickr. Detail from Reflections (Oil Bar Painting as of August 16, 2013), a photo by randubnick on Flickr. 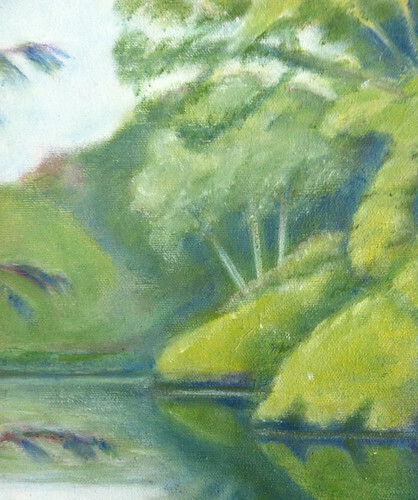 Here is a detail from my oil bar painting of a scene at Bradley Palmer State Park, Topsfield, MA. (This painting is loosely based on a photo that I took there, and you can see it on this site posted on June 14, 2013.) On the 16th (last Friday), I repainted this little stand of three trees, and I thought they looked so much better that I took this closeup photo of them. Reflections (Oil Bar Painting as of August 16, 2013), a photo by randubnick on Flickr. Here is my painting in progress as it looked on Friday, August 16th. I am using oil bars to paint this scene, based on a photograph that I took in Topsfield, MA, at Bradley Palmer State Park (posted here on June 14, 2013.) On the preceding day (Thursday the 15th), I had decided that I had to revise the stand of three trees in the distance because I wasn't happy with the shape and proportions of the tree. Many of the lines in the composition will lead right to those trees, so they need to look good. Given the time already spent on this painting, I didn't want to risk a trial-and-error approach on the canvas. So Thursday night, I used Painter software to try out some solutions, using a photo of painting. I used digital paint to sketch out a couple of solutions, and when I had a solution that I wanted to use, I printed it out. So Friday morning, I was ready to repaint those trees. I started by making a slight adjustment in the ratio of tree-trunk height to foliage. Then I painted in tree branches (even though I knew I would cover them up). Then I revised the shape of the tree foliage, using the branches as a guide, so this little invented tree would make sense. I was much happier with the new shape, so I repainted the foliage and added detail. I was pretty pleased with the result. I even took a closeup photo which I plan to post tomorrow. Reflections (Oil Bar Painting as of August 15, 2013), a photo by randubnick on Flickr. Here is my oil bar painting as it looked several days ago, on Thursday, August 15. I have been working on this project for a while, just an hour every day. This landscape is based on a photo that I took at Bradley Palmer State Park in Topsfield, MA. (The photo is posted here on June 14, 2013, the day before I started painting -- two months ago!) I remember working on the foliage that day, trying to add a little more texture and depth to the foliage. I thought I was almost finished, but something was bothering me, and finally figured out that it was the stand of three trees in the distance. No matter what I did to the foliage, I wasn't happy with the shape, placement, or proportion of that little group of trees. And that meant that somehow I would have to fix it, because the entire composition is leading the eye to that tree. So I wasn't finished after all. But I didn't want to risk the whole painting by using trial and error on the canvas, so I thought I would try out some solutions in Painter using a jpg of the image. To be continued. . . .
Reflections (Oil Bar Painting as of August 14, 2013), a photo by randubnick on Flickr. Here is my oil bar painting, still a work-in-progress, as it looked on Wednesday, August 14. This landscape is roughly based on a photo that I took at Bradley Palmer State Park, in Topsfield MA. (My reference photo is posted here on June 14, 2013.) On Wednesday, I was feeling like this painting was getting pretty close to finished, and I decided to concentrate on tops of the trees across the water, the top one or two inches of the canvas. 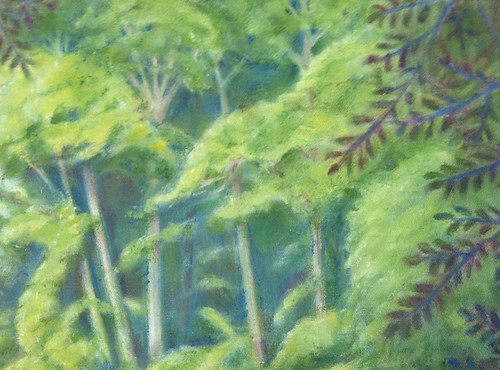 It was while I was painting those tree tops that I realized that one of the four main tree trunks didn't go anywhere! It was a tree-trunk without branches. (If you are amazed that I could have missed that, let me just say that I once painted a portrait for three hours in a painting class without realizing that I had painted in six fingers instead of five.) So the rest of my painting time on Wednesday was spent in creating a tree-top for that tree. It seems like a barely noticeable difference, but if something doesn't make sense in the painting, it creates uneasiness even if the reason isn't clear. Detail from Reflections (Oil Bar Painting as of August 13, 2013), a photo by randubnick on Flickr. This is a detail from the oil bar painting I am working on. 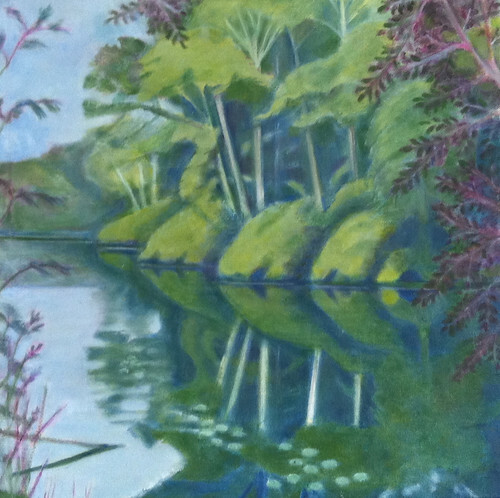 This painting is a landscape based on a photo that I took at Bradley Palmer State Park in Topsfield, MA. (The photo is posted here on June 14, 2013.) 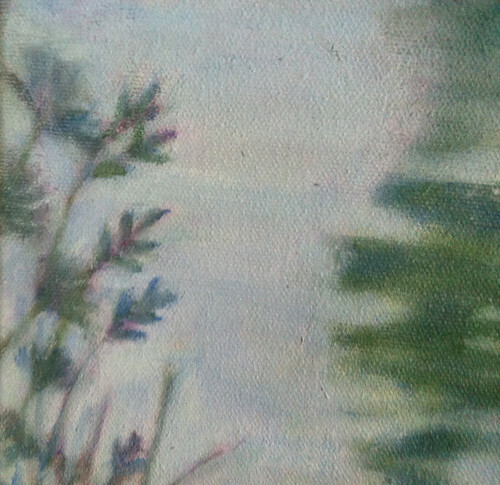 On August 13th, I reworked the foliage at the bottom left part of the canvas and I was finally happy with it how it looked, so I took a close-up photo. Reflections (Oil Bar Painting as of August 13, 2013), a photo by randubnick on Flickr. This is my oil bar painting as it looked three days ago, August 13. 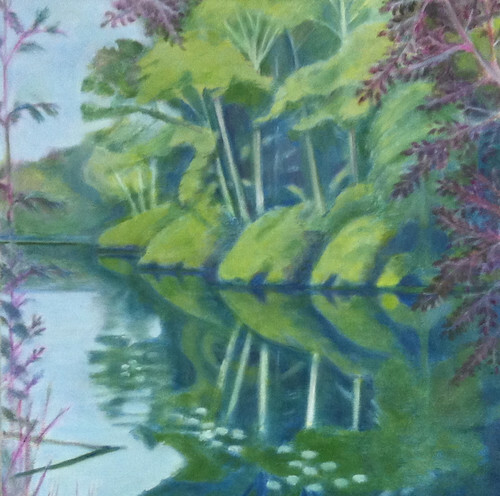 I have been working on this painting of a scene at Bradley Palmer State Park in Topsfield MA. My reference is a photo that I took there on a hot summer day. (The photo is posted here June 14, 2013.) On the 13th, I worked on the left side of the painting. I reworked (and darkened) the tree branches and sky, and also reworked the foliage and water on the bottom right. More to go. . . .
Reflections (Oil Bar Painting as of August 12, 2013), a photo by randubnick on Flickr. This is my oil bar painting, still a work-in-progress, as it looked on Monday, August 12. This landscape is based on a photo that I took at Bradley Palmer State Park, near the Willowdale Estate (photo posted here June 14, 2013.) Several days prior, I had revised that tree so that only the branches were visible, and the trunk was "off stage" to the left. So on Monday, I spent most of my time reworking the branches and repainting the sky. Progress is slow because I am being careful, but I feel like I am getting somewhere. Reflections (Oil Bar Painting as of August 11, 2013), a photo by randubnick on Flickr. This is my oil bar painting in progress as it looked three days ago, on August 11, 2013. I am painting a scene in Bradley Palmer State Park that I photographed last summer. (The reference photo is posted here on June 14.) I am making a lot of small changes as I go, but the most obvious change that I made on the 11th was to rework the lily pads and added some new ones in the lower right hand corner, checking to make sure shape, size, and placement helped to indicate perspective. I also did more work on the dark water, adding a few marks to indicate the surface. Detail from Reflections (Oil Bar Painting as of August 10, 2013), a photo by randubnick on Flickr. 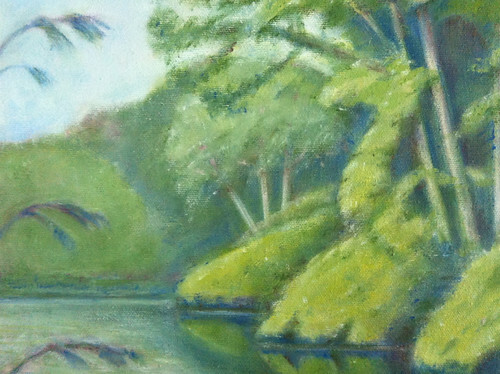 This is a detail from the oil bar painting I have been working on, as it looked on August 10, 2013. The painting is of a scene at Bradley Palmer State Park in nearby Topsfield, MA; I am working from a photo that I took there. (The reference photo is posted here on June 14.) On August 10th (Saturday) I was painting leaves on one of the trees in the foreground. I was really happy as the leaves began to look something like what I had hoped for, so I took some closeup shots, including this one. Reflections (Oil Bar Painting as of August 10, 2013), a photo by randubnick on Flickr. I have been painting this scene at Bradley Palmer State Park, based on a photo that I took there near the river, close to the Willowdale Estate. (The photo is posted here on June 14, 2013.) So this is my painting as it looked on August 10 (Saturday). I spent most of my time painting the leaves of the tree in the foreground, on the right. The leaves were starting to look the way I want them to look, so I was pretty happy, and even took a few closeup shots. Maybe I will post one of them tomorrow. Reflections (Oil Bar Painting as of August 9, 2013), a photo by randubnick on Flickr. This is the oil bar painting I have been working on as it looked on Friday, August 9th. (I am still two days behind in posting.) I am painting a scene in Bradley Palmer State Park, roughly based on a photo that I took there. (My reference photo is posted here on June 14, 2013.) On Friday I worked on the tree on the right side of the canvas. I decided to start by redefining the lines of the branches (they were getting lost), so I repainted them with some blue paint. That made quite a difference. Once I made the branches darker, the tree began to blend into the rest of the landscape. (Even though my goal is a tree that "reads" as dark green, I am using mixing in some red and blue to get there.) Then I kept going for a while, mostly working on the leaves. Reflections (Oil Bar Painting as of August 8, 2013), a photo by randubnick on Flickr. Here is my oil bar painting as it looked on Thursday, August 8, 2013. (I am now running two days behind in my posts.) This is a work-in-progress, a landscape based on a photo that I took at Bradley Palmer State Park in Topsfield, MA. (The reference photo is posted here on June 14.) On Thursday morning, I made a change I have been thinking about for a while: I modified the tree on the left so that only the branches show, and the tree trunk is now "off-stage". Now there is enough room to give the tree branches more graceful lines, the canvas is less crowded, and there is more room for blue sky and clear water. But best of all, the distracting straight vertical line is gone. So I am happy with this little decision. To be continued. . . .
Reflections (OIl Bar Painting as of August 7, 2013), a photo by randubnick on Flickr. This is my oil bar painting as it looked on Wednesday, August 7. (I am still two days behind in my posts.) I am using one of my photos to paint this scene at Bradley Palmer State Park in Topsfield, MA, not far from Willowdale Estate. My reference photo is posted here on June 14. On Wednesday, I continued to revise the reflected shapes in the water, shortening them up a bit because reflected shapes are shorter in water. (Check this out in your local swimming pool.) I also adjusted the angle of one of the reflected trees. And as I worked, I made the water darker. As I worked, I kept thinking about the tree on the left side of the canvas. It is not quite working and I have been trying to decide what to do about it. To be continued. . . .
Reflections (Oil Bar Painting as of August 6, 2013), a photo by randubnick on Flickr. Here is my oil bar painting in progress as it looked when I had finished painting on Tuesday, August 6. (I am now two days behind in posting.) This scene at Bradley Palmer State Park (Topsfield, MA), is roughly based on a photo that I took there. (My reference photo is posted here on June 14.) On Monday, I worked mainly on the water, correcting the shapes of some of the reflections to match the shapes on land--which meant turning the painting upside-down as well as on its side--and also working on making the water a bit darker. Reflections (Oil Bar Painting as of August 5, 2013), a photo by randubnick on Flickr. Here is my oil bar painting in progress as it looked on August 5 (two days ago). This painting is based on a photo that I took at Bradley Palmer State Park in Topsfield, MA (photo posted here on June 14). Some people have said that it looks tropical, and although Massachusetts does look like a rain forest, I have been trying to cool the colors down a bit to see if that helps. 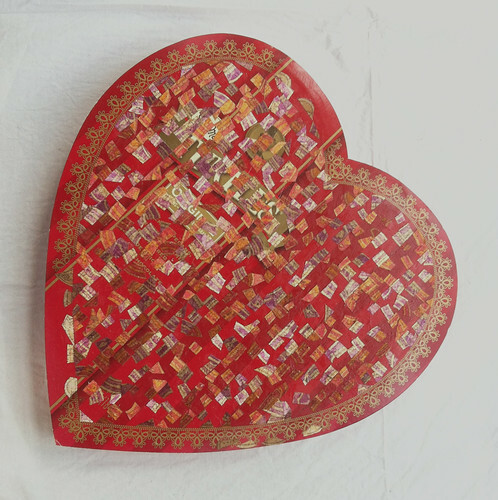 To be continued. . . .
Another Heart Shaped Box as of August 4, 2014, a photo by randubnick on Flickr. Reflections (Oil Bar Painting as of August 4, 2013), a photo by randubnick on Flickr. Here is my painting as it looked on August 4. (I am a day behind in my posts.) I am using oil bars to paint this scene, based on a photo that I took at Bradley Palmer State Park, in Topsfield, MA. But several people have asked if this is a tropical scene. Although I always daydream about Brazil, this is actually the Massachusetts rain forest! So yesterday, with the composition in place, I worked on making the colors a bit "cooler". I toned down the lime green in the foliage to a sage green, and put more blue and gray tones in the water. I also used a ruler to straighten out the horizon line on the left as well as one of the trees. Reflections (Oil Bar Painting as of August 3, 2013), a photo by randubnick on Flickr. Here is my oil bar painting as it looked yesterday, August 3. I am using oil bars to paint this scene, inspired by a photo that I took at Bradley Palmer State Park (Topsfield, MA). The reference photo is posted on this site on June 14, 2013. Yesterday I worked on the tree on the right, in the foreground, trying to figure out where the branches and leaves would logically fall. My concern was mainly the composition, rather than trying to make the leaves look natural at this point. The leaves are red just for now, so I can easily see the difference between the trees in the foreground and the trees on the other side of the river. To be continued. . . .
Reflections (Oil Bar Painting as of August 2, 2013), a photo by randubnick on Flickr. This is my oil bar painting as it looked when I finished working on it yesterday (August 2, 2013). This painting is loosely based on a photo that I took at Bradley Palmer State Park (posted here June 14, 2013). Apart from making some subtle changes to the water on the left, most of my time was spent trying to work out placement of branches for the tree on the right. (I have recently moved a computer into my home studio so now I can open my reference photo on screen and zoom in to see detail, and that has helped a lot, especially with this tree.) There is still a lot of red in those leaves, so I can see what I am doing. Right now these leaves don't look very natural because they are so uniform (and the wrong color). But I will address those problems later. Right now I am just trying to establish placement and composition for this painting, and this tree is pretty much the last piece of the puzzle. Reflections (Oil Bar Painting as of August 1, 2013), a photo by randubnick on Flickr. This is my oil bar painting (in progress) as it looked yesterday. This landscape is inspired and loosely based on a photo that I took last year at Bradley Palmer State Park (Topsfield, MA). The reference photo is posted here on June 14. Until yesterday, I hadn't done much with the lower right corner of the canvas, partly because in the reference photo, it was hard to see what was going on because that area was so dark. So yesterday, before I started painting, I went to the computer, opened my reference photo in Painter, and created a much lighter version of it. Suddenly I could the shapes in the water much more clearly. So I printed out a copy of the brightened version of the photo so I could refer to it while I painted. Then I got to work on the canvas, and painted dark blue and green shapes in the lower right corner. Reflections (Oil Bar Painting as of July 31, 2013), a photo by randubnick on Flickr. Here is my oil bar painting as it looked yesterday, July 31, 2013. (I am a day behind in my posts at this point.) This is based on a photograph that I took at Bradley Palmer State Park (posted here June 14. 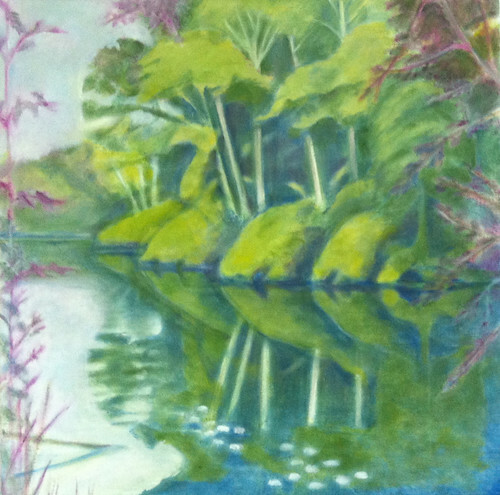 Yesterday I modified the shapes along the shoreline, and also made corresponding changes in the reflections in the water. To do this, I turn the painting and the photo upside-down as well as sideways, and then right-side up again. I also worked on the right hand side of the canvas, and made the water a bit darker. To be continued. . . .